Norwalk, Conn.: The Easton Press,, 2013. True 22kt gold accents deeply inlaid upon raised "hubbed" spine with Smyth-sewn pages and printed on rich and durable archival-quality acid free paper which will not yellow with age. It features excellent end sheets and premium heavy duty boards with a sewn in satin page marker. A new unattached bookplate is provided. . Collector's Edition. Full-Leather, Gilt Edged Pages. Very Fine/ New/No Jacket As Published. Illus. by . 8vo - over 7¾" - 9¾" tall. Limited Edition. 2014-10-22. Good. Ships with Tracking Number! INTERNATIONAL WORLDWIDE Shipping available. May not contain Access Codes or Supplements. May be ex-library. Shipping & Handling by region. Buy with confidence, excellent customer service! 2016-01-19. New. Ships with Tracking Number! INTERNATIONAL WORLDWIDE Shipping available. Buy with confidence, excellent customer service! HarperCollins. First UK hardback edition-first printing. Hardcover. Near fine/Near fine. Near fine condition.HarperCollins,2013.First UK hardback edition-first printing.Black hardback(orange lettering to the spine,two small nicks and dent on the edges of the cover and spine) with Dj(a couple of small creases and nicks on the edges of the Dj cover),both in near fine condition.Nice and clean pages with two small ink marks on the outer edges,a couple of small nicks and crease on the edges of the pages.Nice and clean book with light shelf wear on the Dj cover.530pp.Price un-clipped.A collectable first edition-first printing.Heavy book. 2016-01-19. Good. Ships with Tracking Number! INTERNATIONAL WORLDWIDE Shipping available. May not contain Access Codes or Supplements. May be ex-library. Shipping & Handling by region. Buy with confidence, excellent customer service! 2016-09-02. New. Ships with Tracking Number! INTERNATIONAL WORLDWIDE Shipping available. Buy with confidence, excellent customer service! 2014-07-02. New. Ships with Tracking Number! INTERNATIONAL WORLDWIDE Shipping available. Buy with confidence, excellent customer service! 2013-08-09. New. Ships with Tracking Number! INTERNATIONAL WORLDWIDE Shipping available. Buy with confidence, excellent customer service! 2013-05-07. New. Ships with Tracking Number! INTERNATIONAL WORLDWIDE Shipping available. Buy with confidence, excellent customer service! New York: Katherine Tegen Book, 2013. SIGNED by the AUTHOR on a special tipped in page. Signature only. A First edition, First printing. Book is in Fine condition. Boards are clean, not bumped. Fore edges are clean. Interior is clean and legible. Not remaindered. Dust Jacket is in Fine condition. Not chipped or crinkled. Not price clipped. Dust Jacket is covered by Mylar Brodart. All-Ways well boxed, All-Ways fast service. Thanks.. Signed by Author. First Edition. Hard Cover. Fine/Fine. 2015-06-30. Good. Ships with Tracking Number! INTERNATIONAL WORLDWIDE Shipping available. May not contain Access Codes or Supplements. May be ex-library. Shipping & Handling by region. Buy with confidence, excellent customer service! New York: Katherine Tegen Books. 2013. First Edition; First Printing. Hardcover. 006202406X . Fine in a Fine dust jacket. 1st Edition Full Number Line 10 9 8 7 6 5 4 3 2 1.; Divergent Series; 8.54 X 5.94 X 1.85 inches; 544 pages; Original unclipped dust jacket protected by archival Brodart cover. All domestic orders shipped protected in a Box. .
U. S. A.: Katherine Tegen Books / Harper Collins. Fine in Fine dust jacket. 2013. Hardcover. 9780062024060 . First edition/First printing. Signed by author on title page. Book is in Fine, unread condition. Dust jacket is Fine. This is a "Barnes & Noble Exclusive" edition with "Never-Before-Seen Journal Entries Inside!" Katherine Tegen Books. PAPERBACK. 0062287338 . New. 2015. HarperCollins, 2013. hardcover. New. Author Signed Hardcover Book October 2013 NY: HarperCollins First edition, first printing, mint, new/unread in a flawless dust jacket, signed by author. Each dust jacket is protected in an acid-free archival quality acetate cover. New York: Katherine Tegen Books / HarperCollins, 2013. First Edition / First Printing. Hardcover. Very fine in very fine unclipped dj (as new).. First Edition / First Printing. Hardcover. Book 3 in THE DIVERGENT TRILOGY. SIGNED by the author on a special limitation page preceding the title page. This is a "Barnes & Noble Exclusive" edition with "Never-Before-Seen Journal Entries Inside!" Condition: Very fine in very fine unclipped dj (as new). 2014-07-02. Good. Ships with Tracking Number! INTERNATIONAL WORLDWIDE Shipping available. May not contain Access Codes or Supplements. May be ex-library. Shipping & Handling by region. Buy with confidence, excellent customer service! HarperCollins Children's Books. First edition-9th printing. Hardcover. New/New. Mint condition.HarperCollins,2013.First edition-9th printing(9).Black hardback(orange lettering to the spine) with Dj,both in mint condition.The book is new.530pp.Price un-clipped.Heavy book. This is another paragraph Book Description: The faction-based society that Tris Prior once believed in is shattered-fractured by violence and power struggles and scarred by loss and betrayal. So when offered a chance to explore the world past the limits she's known, Tris is ready. Perhaps beyond the fence, she and Tobias will find a simple new life together, free from complicated lies, tangled loyalties, and painful memories. But Tris's new reality is even more alarming than the one she left behind. Old discoveries are quickly rendered meaningless. Explosive new truths change the hearts of those she loves. And once again, Tris must battle to comprehend the complexities of human nature-and of herself-while facing impossible choices about courage, allegiance, sacrifice, and love. Told from a riveting dual perspective, Allegiant, by #1 New York Times best-selling author Veronica Roth, brings the Divergent series to a powerful conclusion while revealing the secrets of the dystopian world that has captivated millions of readers in Divergent and Insurgent. 2013-05-07. Good. Ships with Tracking Number! INTERNATIONAL WORLDWIDE Shipping available. May not contain Access Codes or Supplements. May be ex-library. Shipping & Handling by region. Buy with confidence, excellent customer service! Katherine Tegen Books. Hardcover. 006202406X Signed by the author. First [1st] Edition, First [1st] Printing. In Very Good, mylar-wrapped dust jacket. . Very Good. 2013. 1st Edition, 1st Printing. New York: Katherine Tegan Books, 2013. Book. Fine. Hardcover. 1st Edition. A square solid tight clean unread near new copy. This copy has a strange crease at the front board gutter probably caused atv the binding process. The priced jacket has some light edgewewar else fine. 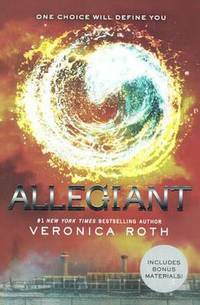 Book three in the series that included Divergent and Insurgent, both run-away best sellers. This is a special Barnes & Noble edition with never before seen journal entries. THIS COPY IS IN MY POSSESSION AND NORMALLY SHIPS NEXT DAY..
2013-08-09. Good. Ships with Tracking Number! INTERNATIONAL WORLDWIDE Shipping available. May not contain Access Codes or Supplements. May be ex-library. Shipping & Handling by region. Buy with confidence, excellent customer service! HarperCollins, 2013. First edition-8th printing. Hardcover. Fine/Near fine. Fine/Near fine. HarperCollins,2013.First edition-8th printing (8).Black hardback(orange lettering to the spine, small nick on the cover) in fine condition, with Dj (two small nicks and scratch on the edges of the Dj cover) in near fine condition.Nice and clean pages as new with a small crease and nick on the edges of the pages.530pp. Price un-clipped.Heavy book. Katherine Tegen Books, 2013. Hardcover. As New/Fine. Signed by author. Katherine Tegen Books. Paperback. 0062287338 Please allow 4 - 14 business days for Standard shipping, within the US. Thank you for supporting our small, family-owned business! . New. 2013-10-22. Katherine Tegen Books. Paperback. 0062287338 Please allow 4 - 14 business days for Standard shipping, within the US. Thank you for supporting our small, family-owned business! . Fine. 2013-10-22. 2016-09-02. Good. Ships with Tracking Number! INTERNATIONAL WORLDWIDE Shipping available. May not contain Access Codes or Supplements. May be ex-library. Shipping & Handling by region. Buy with confidence, excellent customer service! New York: Katherine Tegan Books, 2013. Book. Fine. Hardcover. 1st Edition. A square solid tight clean unread unopened as new copy. Book three of the trilogy that includes Divergent and Insurgent, both run-away best sellers. THIS COPY IS IN MY POSSESSION AND NORMALLY SHIPS NEXT DAY..
HarperCollins, 2013. First edition-7th printing. Hardcover. Near fine/Near fine. Near fine condition. HarperCollins,2013.First edition-7th printing (7).Black hardback(orange lettering to the spine, two small nicks on the edges of the cover) with Dj (small nicks on the edges of the Dj cover), both in near fine condition.Nice and clean pages with two very small tears and nicks on the edges of the pages.530pp. Price un-clipped.Heavy book.